Kimberlee Sue Moran has been a forensic consultant and educator since 2002. 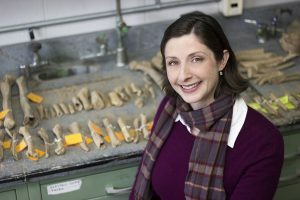 She holds an undergraduate degree in Classical and Near Eastern archaeology from Bryn Mawr College and a Masters of Science in forensic archaeological science from the Institute of Archaeology at University College London. Kimberlee worked as a contract archaeologist for Hunter Research, a CRM firm based in Trenton, NJ, prior to moving to the UK. She moved back to New Jersey in 2010. Her archaeological research includes ancient fingerprints, artificial cranial deformation, the Whispering Woods site in Salem, NJ, and the First Baptist Church of Philadelphia also known as “The Arch Street Project”. This site contains information on a range of Kimberlee’s past and current projects. Page last updated at 5:28 am September 19, 2018 . This page was printed from kimberleemoran.camden.rutgers.edu/ on Wednesday, April 24, 2019.